What is the Best Way to Mount Snow Retention to a Metal Roof? Metal roofs are a smart decision. But with metal roofs, you must consider the risk of roof top avalanches. A quality snow retention system will help you maintain your roof, avoid personal and property damage, and efficiently and safely allow snow to melt off your structure. But there are a number of methods to mount snow guard systems. What is the best way? 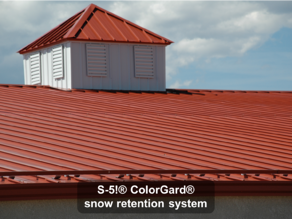 If you own property with a metal roof in snow country, you definitely understand the importance of snow retention. Whether residential or commercial, you have already made a smart decision by choosing a roof that has the longest service life possible. Metal roofing is indeed a “slippery slope” (pun intended), as you must consider the risk of roof top avalanches (personal danger and property damage), as well as the need for snow removal maintenance. A quality snow retention system will help you avoid these drawbacks, allowing the snow to melt safely away, providing decades of trouble-free service of your roof. 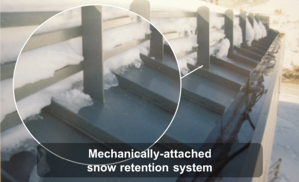 There are three basic methods available for mounting snow retention systems to roofs. • Two designs are mechanically-attached, using the process of either clamping to the seam (non-penetrating) or screwing through the roof material (penetrating). • The third is chemically-attached and uses a “stick-on” method, which involves gluing individual snow guards to a roof. 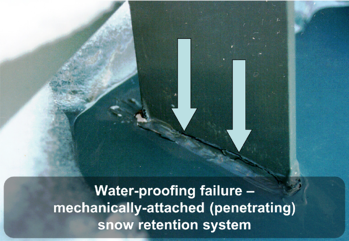 An important note in respect to mechanically-attached systems is the distinction between clamping and drilling a snow retention system onto a roof. Drilling requires holes. 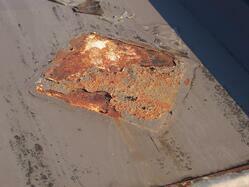 And holes in a metal roof need to be properly weather-proofed to prevent leakage. At S-5!, we manufacture and market clamps and brackets to reliably mount snow guard systems to metal roof seams with clamps and setscrews that compress the seam material against the opposite wall of the clamp – dimpling the material, but not penetrating it - and without creating holes. For roof profiles that do not allow this clamping technology, we also offer penetrative attachments—but with some special (and vital) features. The sealants we use for waterproofing the holes created are designed to last the life of the roof. They are also protected from harmful UV sunlight—and they utilize part designs that prevent over-compression which can also compromise their service life. AND we test and warrant their performance in accordance to ASTM E 2140. This first method uses a seam-clamping attachment. This is a strong and secure option if the roof is a standing seam style metal roof. 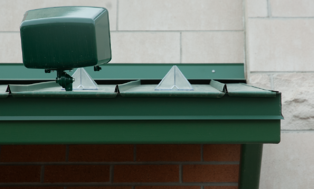 Clamps attach directly to the roof seam using polished, round-point setscrews that do not penetrate the metal (mechanically-attached). Avoids drilling holes that could leak and that might void your roof warranty. Clamp-to seam attachments will not fatigue due to thermal heating or cooling of the roof. Easily mounted even after the roof has been installed. When this method is used, the sliding force of the snow is transferred to the clamp and then into the roof panels themselves. The holding strength of such a system should be documented through rigorous testing and must be able to resist the loads to which it is exposed. These loads do vary from job-to-job. Here at S-5! we have tested our clamps with almost every metal roof profile available. You can view these results directly on our website at S-5.com under the “Load Test Results” tab located at the bottom of the page. 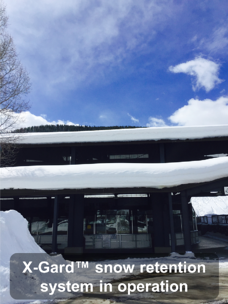 The second type of snow retention is a system that attaches through the roof and into the building structure (also a mechanical-attachment). A strong, secure, and reliable method if properly designed, installed and waterproofed. Only suitable for a roof that is attached the same way (i.e. with screws that penetrate the roof’s surface, attaching it to the structure). 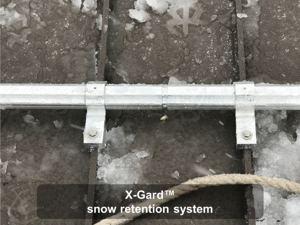 With snow guards that attach directly to the structure, holes will need to be drilled (or other penetrations required) to anchor snow guard brackets, to ensure secure placement and the long-term service life of the roof. If this is not done correctly, you run the risk of developing leaks. To accomplish this, prior to installation with other (non-S-5!) products, you will need to perform additional steps to waterproof these roof penetrations, and you will have to know something about sealant chemistry, part design, sealant selection/sourcing, etc.). With S-5! components, we take the guesswork out and provide an appropriate system with sealants factory-applied. You simply remove the protective release paper and install. 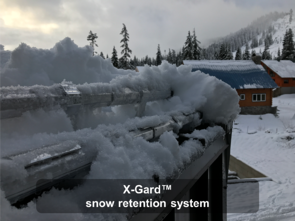 Again, the strength of the structural attachment mounting method is also important and should also be proven and matched to the in-service loads to which the snow guard will be exposed. At S-5!, we take the magic out of all that with web-based tools, enabling you to do all this quickly and easily. And these tested, proven and scientific holding strengths, are engineered to the specifics of your project—not using someone’s “by guess or by golly” assessments. The third type of snow retention is a stick-on (adhered) part. Some variations employ a factory-applied adhesive (chemical-attachment) and others a field-applied one. Stick-on systems appear on the surface to be a very convenient and lower cost option. Lower cost only when considering single part cost, not total job cost (e.g. labor, required guard quantity and distribution over the roof surface). Total cost needs to include replacement costs over the life of the roof. This is not “if”, but “when” the adhesive diminishes in holding strength and how quickly that happens – which then requires replacement. 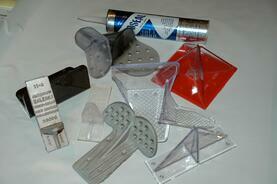 Adhesives all diminish in holding strength, beginning with the first day of exposure. We have witnessed thousands of examples of this and have seen the replacement time from one to eight years. Installation is simple enough. These parts attach directly to the roof with a glued application. But if you look more closely at the detailed instructions, installation becomes a bit more complicated – careful surface preparation is required, as well as many days of curing time at specific temperatures. (Suddenly, this is not as simple as it first seemed to be). 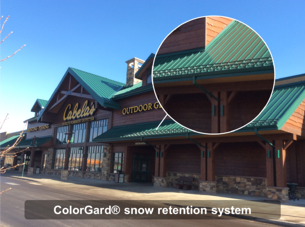 When installed, stick-on snow guards typically have the lowest holding strength (which continues to diminish with age). 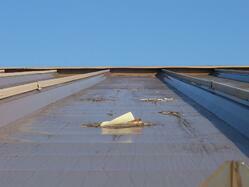 When they fail, they can rip away paint and protective roof coatings, causing corrosion. They also have the lowest lifespan due to the glue and/or plastic part being unable to handle the harsh elements and total exposure that is required on any roof (e.g. U.V., moisture and temperature change, etc.). 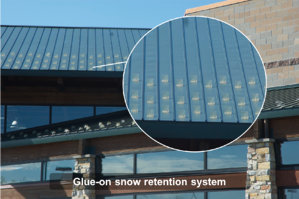 It is critical to understand the unpredictable nature of snow melt on a metal roof. 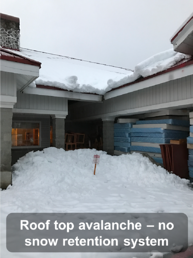 But there are steps to take to thwart dangerous roof top avalanches. A quality snow retention system will help preserve your roof and allow snow drifts and snow melt to exit the roof in a more controlled manner. 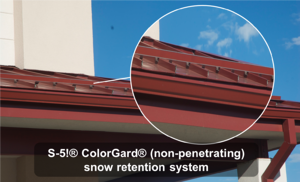 Learn more about installing snow retention systems with mechanical attachment via clamp mounting or structural attachment and weather proofing at S-5.com. Don’t just believe what we say because we said it! MCA (Metal Construction Association) technical documents are the greatest aid available for snow guard selection criteria and downloads are free. Visit MCA for more information.